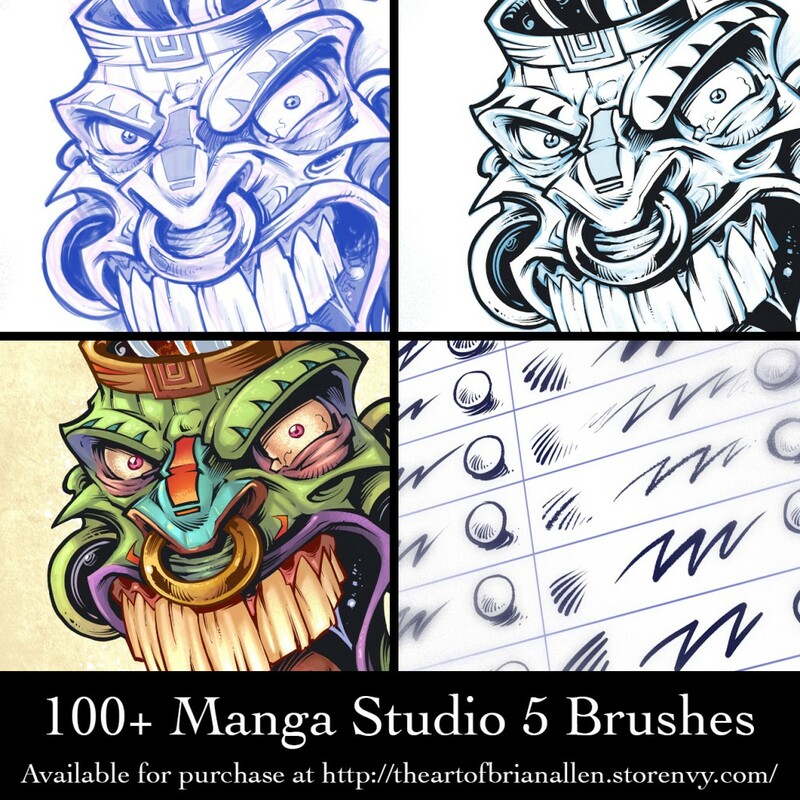 Brian Allen of Flyland Designs contacted me last week and provided me with a brush set with the humble request to review his site. I can say without a doubt that I would recommend his brush set first. A low price of $2.99, a hundred brushes and, most of all, demonstrations of most of them at work. You’re essentially purchasing a brush pack with a tutorial. At that low price, there’s really no competitor that I know of at the moment. The inking brushes include a mixture between textured inks and classic replications of older brushes. If you’re coming from Manga Studio 4 and are looking for faithful reproductions of some of the older tools, this brush pack provides them. My personal favorites are the pencil brushes. Some of them are sketchy and some of them could probably be used for inking. They find that careful balance between soft and hard where sketching experience becomes fluid. Sketching and inking merge into a cohesive experience instead of being two different disciplines. It makes the overall journey towards cleaner art much more satisfying. For expert artists, demonstrations aren’t that important, but it is a critical touch for brush packs. There is a sense of guidance that comes from his examples. A human touch completes the pack. Seeing how the brush designer uses drawing tools helps the user understand how the brush works, how the user can adjust their settings to better suit the brush, and simply know with a sense of confidence that they work. I remember the times I would dig through DeviantArt for Photoshop brush packs and spend more time trying to figure out how things fit into place instead of drawing. Throughout the week, I’ll be posting drawings with this brush set. It’s something I haven’t done before or done much of to begin with, but it’s worth it. You can find the brush set and demonstration videos here.